There are two things said about roast chicken with regard to the French. One, this is one of those quintessential dishes of French cuisine. 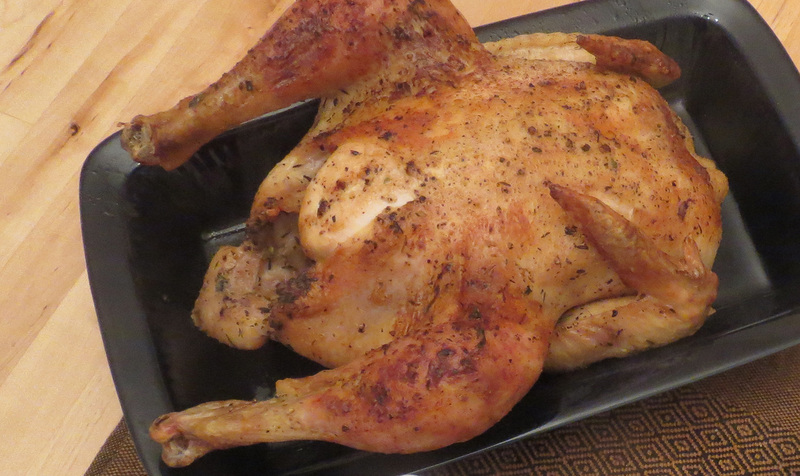 No one in France, least of all a professional cook, can call him or herself that without being able to make a perfect roast chicken, and in less than 90 minutes. I said, “perfect” and I said, 90 minutes. Second, there is sometimes only one test of the chops of a cook, in France, or anywhere else (unless it’s certain parts of China, where I believe they have their own magic ways with chicken), and that is, to roast a perfect chicken. Here’s how it’s done. At least here’s how I do it. Works every time. I’ve done it dozens and dozens of times. The stove is immaterial, as long as it works, and it can reach at least 450 degrees fahrenheit. Forget convection. Forget broilers. Forget any prep, except a sink big enough to rinse the chicken with clean cold water. 1 3-4 pound chicken, preferably free-range, with no additives (no hormones, no drugs), but fresh air, sunshine, and whatever chickens naturally eat, which includes insects, grubs, and their larvae. Don’t use a smaller chicken or a larger one. I currently get my chickens from Lancaster County farmers, who raise them entirely naturally and slaughter them humanely and get them to market very quickly after they’ve been knackered. 2-3 Tablespoons of vegetable oil. You can use EVOO, but what a waste. Use canola, or even better grape seed, oil, either of which add no flavors of their own to adulterate the natural fats of the chicken that will render out as it cooks. Semi-coarse sea salt (Celtic salt from France is best; really, no kidding). Get the unadulterated kind, with no additives. A good adjustable pepper grinder, set to semi-coarse, and filled with a good kind of peppercorn. You can never go wrong with Tellicherry. And it’s food, for God’s sake, and you don’t use much, so spend a little money on it. 2 Cups of chicken or vegetable broth. Use any of the really healthy brands from, say, Whole Foods Market (their own brand is cheapest). Best to use low-sodium or no sodium versions, but no really big deal if you don’t. If you buy a brand that says it’s “organic,” you’ll be safe. Rachel Ray also markets broths that are amazingly good, and as far as I can tell, not hazardous to your health. Who knew? I can’t attest to the rest of the celebrity/tv chefs with their own brands. Avoid Swanson, Campbell, or any of those huge conglomerate vendors. They’re packaging chemicals in a can. In fact, don’t use it if it comes from a can. Look for those hermetically sealed boxes that hold about a liter of broth. Incidentally, “broth” or “stock” on the label makes no difference for our purposes. Set a rack in the middle of the oven, with no racks above it. Preheat the oven to 475 degrees. Even if you’re not certain it gets to that temperature, use that setting. You’ll be cooking by looking (and touching), plus, if you’re really a very careful person, using a small instant reading thermometer, so too much precision is not called for. If your oven can’t reach 450 degrees, no crime either, it will just take longer and won’t turn out quite the same way, in which case you can tell your guests or family it’s “nearly perfect” chicken. If your oven can’t reach 350 degrees (and you’re unaware of this obvious deficiency) you shouldn’t be cooking. Put the two cups of chicken broth or stock in a saucepan on the stovetop and bring to a simmer, and then set to very low heat. You’re just keeping it hot, but not too hot. Don’t boil it. Rinse the chicken inside and out under constantly running cold water in the sink. Remove all objects, including those the chickens was born with, but separated from by the butcher, from the inside of the chicken. Set aside all these residual objects. You don’t need them to roast the chicken. Pat the chicken dry all over with paper towels, and set on a bed of paper towels on the counter. First salt and pepper the inside of the chicken through the cavity in the rear end. While you’re doing this you can pull away from the carcass all extraneous gobbets of chicken fat, and set them aside with the goodies the butcher stuffed inside. Turn the chicken over, breast side down, and drizzle about a tablespoon of oil on the chicken and then rub it all over the bottom. All surfaces. Turn the chicken over, and set it down on the paper towels and repeat with the breast side up. You should end up with a fully oiled chicken, including all crevices. Salt and pepper all readily accessible surfaces of the chicken, top and bottom. In a low-sided metal roasting pan, large enough to accommodate the chicken with at least an inch or two around it, but no more, on all sides, put the remaining oil and spread it on the inside of the pan. Place the chicken breast-side up in the pan, more or less in the center. Place the chicken in its pan in the oven, in the center of the rack. Ideally, in about five minutes you should begin to hear sputtering sounds emit from the oven. Fifteen minutes after you started the chicken, remove the pan to the stove top, and then pour in enough of the stock (careful it will spatter a little at first) to surround the chicken in about an inch, or a little more, of the liquid. With the bulb baster, quickly baste the bird all over the top with the liquid. Replace the pan in the oven, and once you’ve closed the door, lower the temperature of the oven to 450 degrees. Every 12-15 minutes, without fail, open the oven, and if you can do it with the pan in the oven, baste the bird all over. If not, take the pan out, close the oven, and baste it on the stove top. If the liquid goes below the one-inch level, add some more from the saucepan. The chicken will brown very quickly and evenly (unless your oven is a total disaster), and will have started visibly to do so the first time you take the bird out to pour in the broth. After about an hour (you should have basted it by this point four to five times), grab hold of the leg and move it using the thigh joint as a fulcrum. If the bird is done (which is possible, but unlikely) the joint will feel kind of loose. If it’s not moving at all, the bird is not done. Go ahead with the basting that’s due at that point, and put the bird back to cook some more. After another fifteen minutes, the joint should feel loose, especially compared to the first time you tried. If so, or even if not, this is when you should use your thermometer. Carefully insert the probe into the fleshiest part of the thigh, and try to avoid touching a bone. Inserting it about an inch is sufficient. The bird is ready to remove from the oven if the temperature is at least 160 degrees (for you sticklers, I’m aware that USDA safe minimum recommended temperature is 165°, it will reach that temperature). In all events, the bird should not cook for more than another five minutes. Remove the pan to the stove top and place a tent of aluminum foil over the top of it. After five minutes, remove the bird and its tent to a serving platter or cutting board. In the process of removing the bird from the pan, you will discover that there are cooking liquids that have accumulated in the cavity. Upend the bird as you move it and allow these to pour into the pan with the rest of the juices. Using the bulb baster, one of those special fat skimming cooking spoon, or even, if you want to get fancy, a fat separating graduate [this is a good one, also available from other online retailers, and most kitchenware stores: http://www.cooking.com/2-c-good-grips-fat-separator-strainer-with-lid-by-oxo_411711_11/]. remove all but about 1-2 tablespoons of fat from the liquid left in the pan. Put the ban on a burner and turn it to high, and the liquid should be boiling turbulently in about a minute. Add a bit more of whatever stock or broth is left, and add, maybe, an ounce or two of dry white wine. Let the added liquids boil off and allow the sauce to reduce until it coats a spoon, all the while scraping with a heat-proof (wood or silicone) spatula or flat whisk. You should end up with ½ to ¾ of a cup of sauce. If you’re really good, I’ll tell you how to prepare some pan roasted potatoes at the same time the chicken is cooking, potatoes that you might just consider perfect, of their kind, as well. I can’t swear that an American chicken, even as good as those in Lancaster County, will measure up to a Poulet de Bresse, but as far as my taste memory serves, it will be as good as any other chicken I’ve roasted in France. This entry was posted in French food, Recipe by howard. Bookmark the permalink. This was indeed fabulous! Thanks! It will replace my beloved Marcela Hazan chicken with lemons recipe. Looking forward now to the leftovers!